A Local Improvement District (LID) would provide some of the amenities of being incorporated without the cost of creating a city government. Examples…. • Improved status of roadways maintained by CDOT. Becoming a LID would move Evergreen from “rural” status such as roads south of Fairplay to urban status for upkeep of roadways, curbs, gutters, and crosswalks. • Trail connectivity between activity centers. • Creation of a more cohesive feel to the Evergreen community. A LID is not a new layer of government. • It would be managed by the Jefferson County Commissioners, who would delegate existing staff to administer projects and exercise contracts. • Single-use LIDs have been utilized previously in Evergreen to fund the paving of roads in subdivisions such as Evergreen Highlands, Evergreen Meadows and El Pinal. • Elsewhere in the county, the County Commissioners currently oversee a local improvement district formed in 1988 for an area surrounding Southwest Plaza. How is a Local Improvement District created? A LID requires specific boundaries. The boundaries being considered would overlap two existing special districts: Evergreen Metropolitan District and West Jefferson County Metropolitan District. Generally, the district being proposed would extend from north of Marshdale on the South to El Rancho on the North. Although creation of a LID can occur without a vote of property owners within the district, imposing a sales tax to fund a LID does require such a vote. A LID requires some sort of revenue stream, generally a sales tax (not a property tax). A 1% sales tax is being considered. Jefferson County Commissioners would need to be convinced the community is supportive of the idea before it would approve the concept. How would LID money be used? • 100% of the money collected from the local improvement district would be used to fund local improvements within the district. A list of potential projects and improvements is being created through community input. • Monies cannot be used by the county to offset current expenditures. • Monies could be used to augment other tax dollars being allocated for improvements, i.e., if CDOT were to put medians in to separate lanes of traffic, LID money could be used to beautify the medians with trees. • The improvements would be governed by a “constitution” drawn up by the community itself to govern the kinds of improvements desired. The governing document will be designed to provide guidelines general enough to still be effective for decades to come. • An Advisory Group would make recommendations to the County Commissioners, but the County Commissioners are not required to follow the recommendations. What is the proposed timing? • Mid-June 2017: Meet with County Commissioners to demonstrate community support and to ask approval of the concept. • November 2017: Placement of proposed sales tax question on the ballot. We are proud to spread the word that the Evergreen Downtown Business Association was announced today as a Candidate Creative District with the Colorado Creative Industries. The EDBA has worked very hard to develop a strategic plan for Downtown Evergreen as a Creative destination and DEED is a close supporting partner. 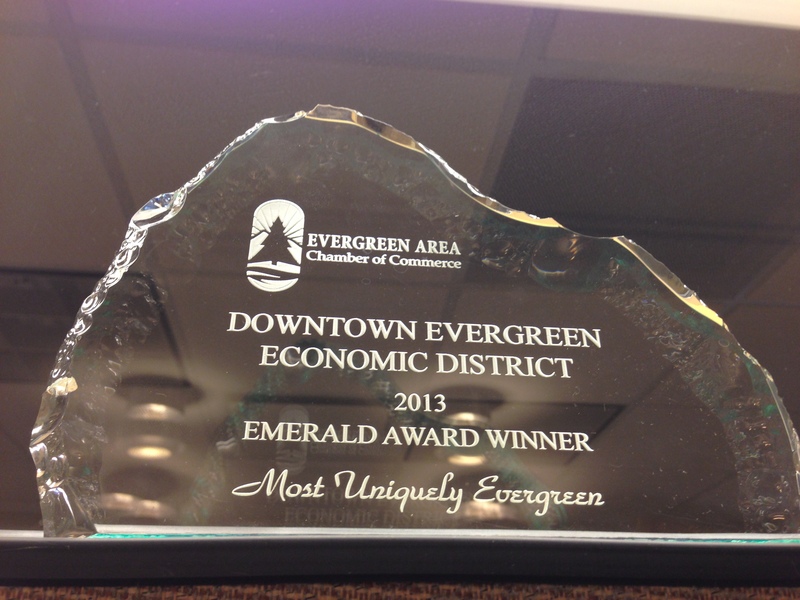 We look forward to seeing the EDBA continue the great work they are doing and plan to stay involved as a strong partner with them and the program as it will provide many new opportunities that are core to our mission at DEED for improving the infrastructure in the Greater Downtown Evergreen area! 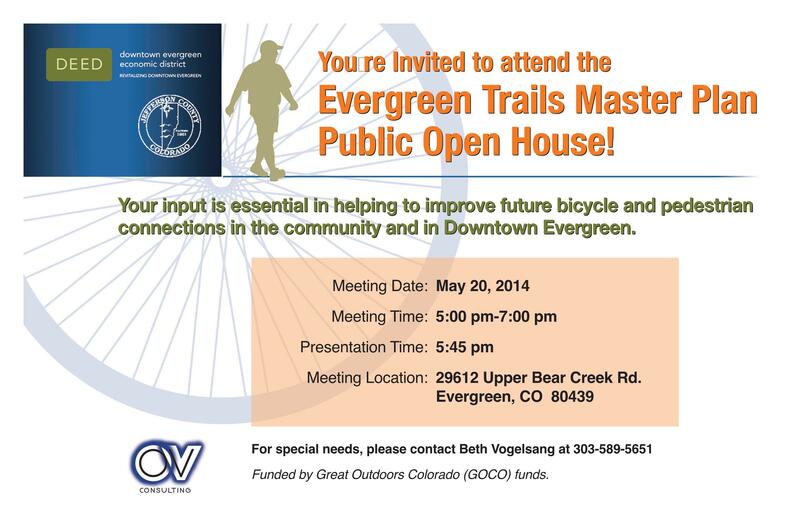 Mark your calendars for the first Evergreen Trails Master Plan Open House at the Evergreen Lake House on May 20, 2014 from 5:00-7:00 pm. We hope to see you all there so we can get some great input for the future of Downtown Evergreen’s connections! We are honored to be recognized by the Chamber in this capacity and intend to continue to exemplify the service and principals that warranted this achievement. As soon as the Chamber posts the photos from that evening, we will re-post them here. Work Begins on Retaining Wall Downtown! We are thrilled to report that CDOT has begun work on the retaining wall in Downtown Evergreen that was damaged by the September floods. 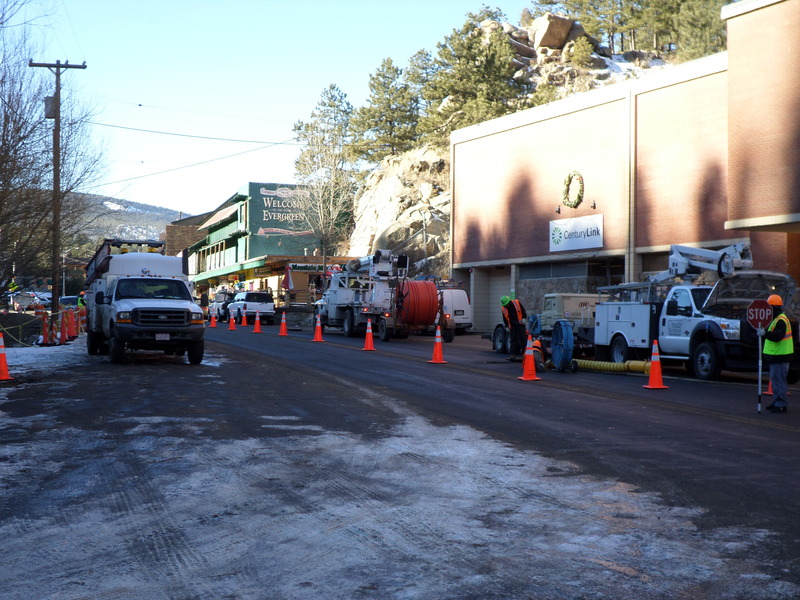 We have been in contact with CDOT as well as the other stakeholders along Highway 74 regularly since the floods and have maintained a communication link between Downtown Evergreen and the agencies involved. 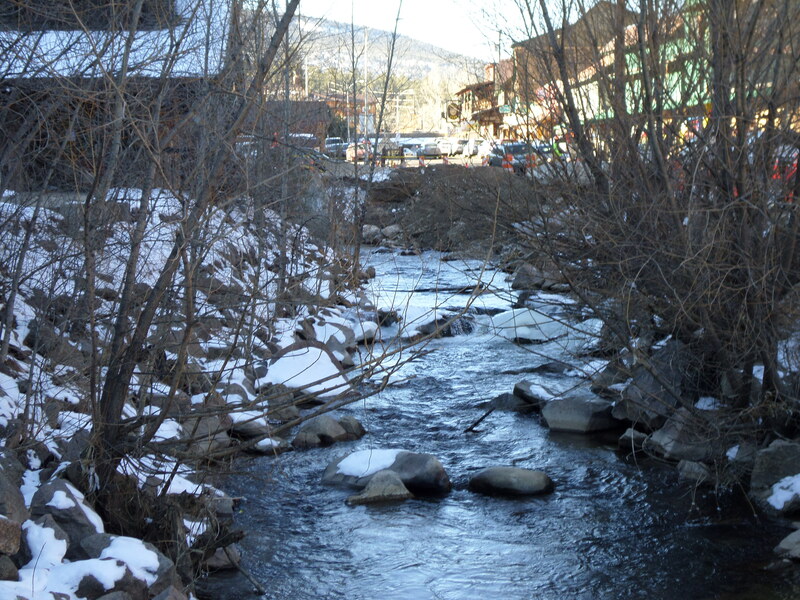 As of the last week, The portion of the wall that was lying in the creekbed has been removed and Bear Creek has been cleared of all of the debris from the wall failure. The next steps involved include repair of the utilities that were affected by the failure and subsequent scouring. Then a new retaining wall will be constructed to reinforce the embankment of the creek. We are thrilled to announce our second successful grant application with Great Outdoors Colorado (GOCO)! Our government sponsor, Jefferson County Transportation and Engineering, continued working with DEED after a first attempt and a combination refining the scope, raising the stakes and an expert rewriting of the application, we were awarded $49,000 in grant funds to prepare a master plan for safe non-vehicular connectivity in and throughout the Downtown Evergreen district. With $10,000 in matching funds and another $10,800 of in-kind contributions from EVstudio and EPRD, the total project funding comes to $69,800. Our own Evergreen Legacy Fund is providing the matching resources and this award would not have been possible without the generosity of all of the members of the application team. 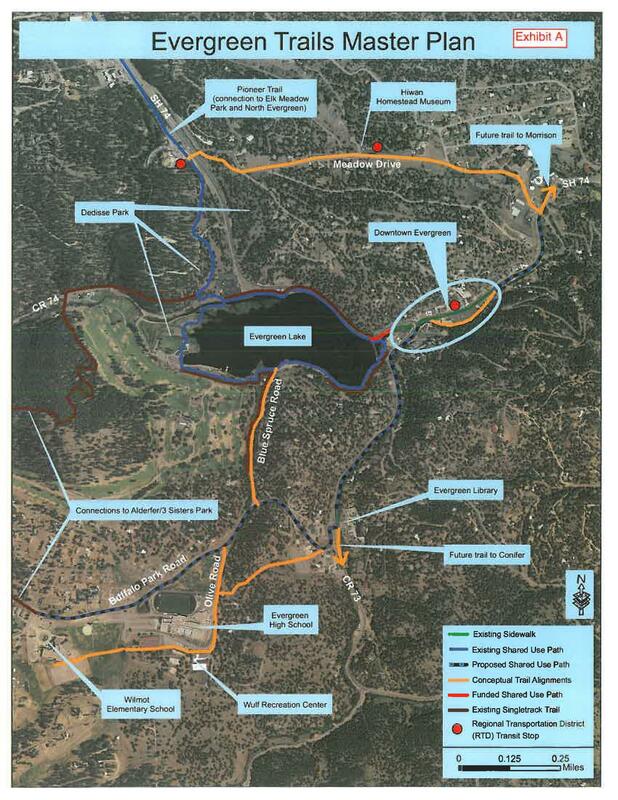 This master plan is a critical pre-requisite to the funding of each component of the trail system that will be outlined in the master plan. It will involve a culmination of all previous planning work done over the years, a tremendous amount of mapping and GIS work and a significant community outreach effort to ensure that all of the Evergreen Community has a voice. We will be working not only with our sponsor, Jefferson County Transportation and Engineering, but other agencies as well, including Jefferson County Open Space and Evergreen Park and Recreation District. The work now begins and we plan to kick off the process with all stakeholders before Christmas so we can hit the ground running in the new year!